If you’re planning a wedding, now is a busy and exciting time. It seems like there’s a never ending to do list, including picking the ceremony and reception sites, deciding on a dress, and coordinating the flowers and décor. Of course, there’s also the matter of choosing the wedding bands you want to wear for the rest of your lives. Brilliance.com knows that many couples want to match their diamond wedding rings to the bride’s diamond engagement ring. Many couples choose the engagement ring first and then choose diamond rings to match months later. Some couples only want to match the bride’s diamond rings. Others still want to match all three pieces, either by using the same metal or by choosing diamond wedding rings for both the bride and groom. For instance, if the bride has a platinum round solitaire engagement ring, the couple can choose platinum diamond wedding rings, plain platinum wedding bands, or choose a platinum band with diamonds for the bride and a plain platinum band for the groom. Couples should choose what they want and not worry about any sort of ‘rules’ regarding diamond wedding rings. Having his-and-her rings that complement each other is romantic and symbolic of the close bond between the couple. Just like you and your soon-to-be spouse, matching rings are beautiful on their own, but even better when they are together. 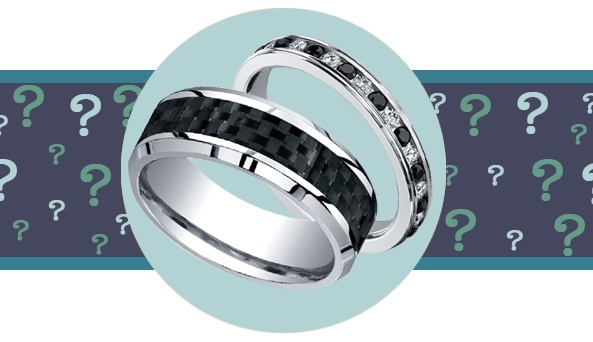 Many couples who shop at Brilliance.com choose platinum for their wedding bands. Platinum is a high-end precious metal that is durable, elegant, and valuable. Although platinum is one of the most popular metals for diamond wedding rings, it isn’t the only material available for rings. Other popular metals include palladium and 14K or 18K white or yellow gold. It’s important to remember that choosing a metal is about much more than simply picking one that looks good. Couples also need to consider whether or not the metal is right for their lifestyles. For this reason, it’s best to research the pros and cons of each metal prior to shopping for your rings. For example, men typically work more with their hands, so they will need a ring that is made out of a durable and scratch resistant metal. Luckily, men’s wedding bands are available in different metals than many women’s diamond rings. Some of these rings are made out of stainless steel and tungsten, both materials that are designed to hold up to harsh wear and still look great. If you or your future husband relies on your hands, it may be a good idea to buy a ring made out of these metals. Once you’ve chosen the metal, it’s time to consider the fit and finish. Our research at Brilliance.com shows that wedding rings are the most often worn piece of jewelry so it needs to be comfortable, especially for men who may not be used to wearing a ring. To make wedding bands easy to wear, Brilliance.com offers Comfort Fit wedding bands. These specially designed bands have rounded inside edges, which makes them comfortable to wear. After just a few weeks, you’ll forget you’re even wearing a ring. Men should also consider the weight of the metal used to create the ring when looking for a comfortable fit. Titanium is one of the most lightweight precious metals in the world, so men won’t notice any additional weight on their finger when wearing their ring. However, other metals are heavier, so it may take more time to get used to wearing them. Another factor to consider when choosing a wedding band is the finish. Many wedding bands are available in a variety of finishes, meaning couples can choose wedding bands as special and unique as their love. Some of the most popular finishes are Florentine, hammered, and satin. Wedding bands with a Florentine finish are created by scratching intersecting sets of parallel lines into the surface of the metal. These tiny deep scratches create a unique textured surface. This technique adds character to the ring and often gives it a slightly vintage and worn look. A ring with a hammered finish literally looks like it’s been pounded on with a tiny hammer, which creates a textured and multifaceted finish. The multifaceted surface of a hammered ring often catches the light to create a brilliant shine that will draw attention to your beautiful wedding ring. Although antique hammered finish rings are likely one of a kind and hammered by hand, most of the hammering is done by a machine today. Satin is another popular finish option. Wedding bands with a satin finish have a semi-glossy surface that looks sleek and sophisticated. The metal is scored with a tiny brush that creates tiny, shallow parallel lines along the surface of the ring. These small scores reduce the metal’s natural shine and give it a finish that’s not quite matte and not quite glossy, so you can have the best of both worlds. If you want to have completely personalized wedding rings, consider engraving a special saying on the inside. Some couples choose to engrave their rings with their wedding date and the year or a meaningful phrase. If the phrase you want to use doesn’t fit on one ring, think about splitting it up and engraving the first part on one ring and the rest on the other. It’s also common for couples to engrave each other’s names or initials inside their wedding bands to express their undying love and commitment to one another. The options are endless, so feel free to choose anything that carries a special meaning to you. If engraving your ring is important to you, make sure to take it to an engraver experienced in jewelry and leave plenty of time to get the rings back. You don’t want to be left without your rings on your wedding day just because they’re not back from the engraver. Make sure you also print clearly when writing out what you want engraved on your ring. If your handwriting is messy, the engraver may misread what you have written and engrave the wrong phrase or date. In the past, diamond rings used to be reserved for special anniversaries or whenever a couple decided to upgrade their wedding set. But, why wait? These days, more and more couples are choosing to buy diamond wedding rings from the beginning instead of planning on replacing their wedding bands later in life. Planning a wedding and choosing wedding bands are fun and exciting times, so enjoy looking and remember that the personal shoppers from Brilliance.com are standing by if you need any help.